On Wednesday evening the villagers of Ni’lin held a candle-lit procession to outside the expanding settlement of Hashmoniim. 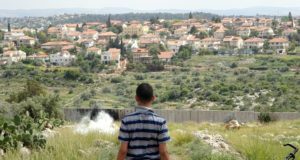 Villagers and international peace activists marched towards the nearby settlement and stopped at the site where the Israeli state is building the wall that will cut Ni’lin off from it’s land. Before leaving the construction site of the wall, demonstrators blocked the road to prevent the bulldozers from working the following day. Flares were shot towards the protesters, though it was unclear whether these were shot by Israeli soldiers or settler security personnel. 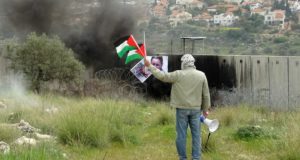 The villagers of Ni’lin protest against the construction of the apartheid wall several times a week – by making peaceful demonstrations, holding prayer meetings, candle processions and other kinds of non-violent activities. 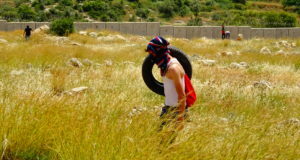 This time the Israeli army didn’t respond violently, but most of the time the non-violent resistance of Ni’lin is met by heavy violence from the Israeli army. Still the villagers continue the struggle for their right to their own land.